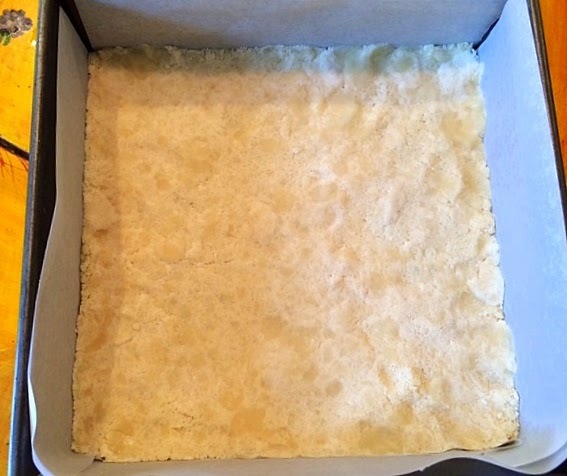 Scotland may not have gained independence after yesterday's historic election, but it will always have its most famous pastry -- Scottish Shortbread. While the vote was being tallied, I decided to bake this country's greatest gift to the pastry world -- an easy and delicious wonder of a cookie. 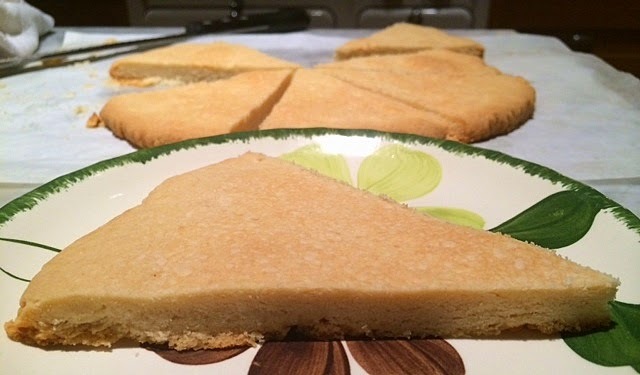 Traditional shortbread has just three ingredients: sugar, butter and flour. 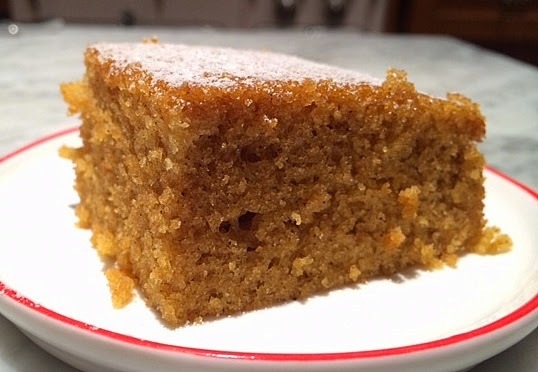 I was lucky enough to have a recipe from Olive Facey whose family was originally from Alloway (birthplace of Robert Burns), given to me by her son Stephen shortly after she passed away a few years ago. Despite her Scottish heritage, Olive's recipe calls for confectioner's sugar, while the the truly traditional cookie uses white sugar. But the result was fantastic, proving that one can certainly improve upon tradition. Start with room temperature butter. 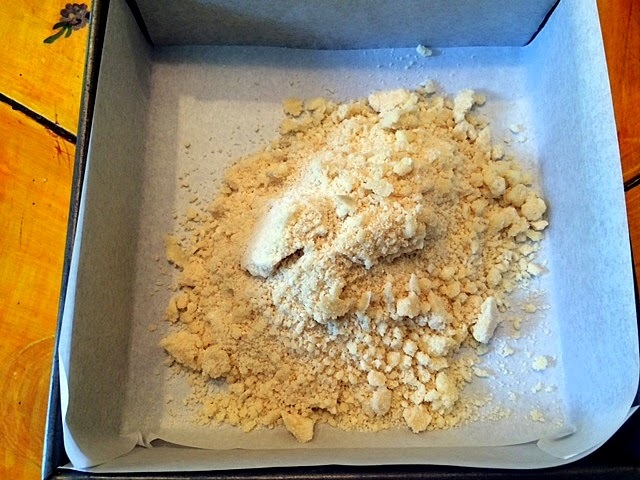 Blend it well with confectioner's sugar and gradually add the flour. 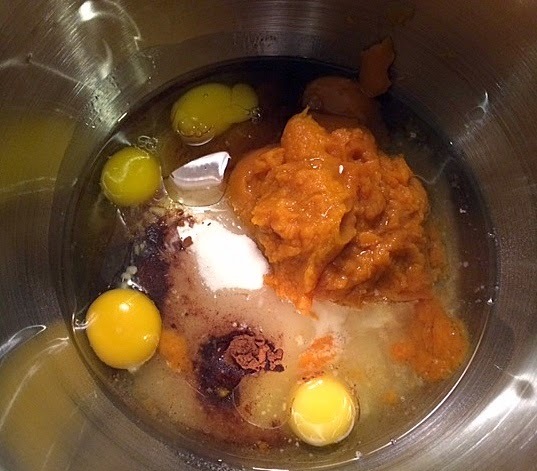 When it's all blended, it will be a bit lumpy. 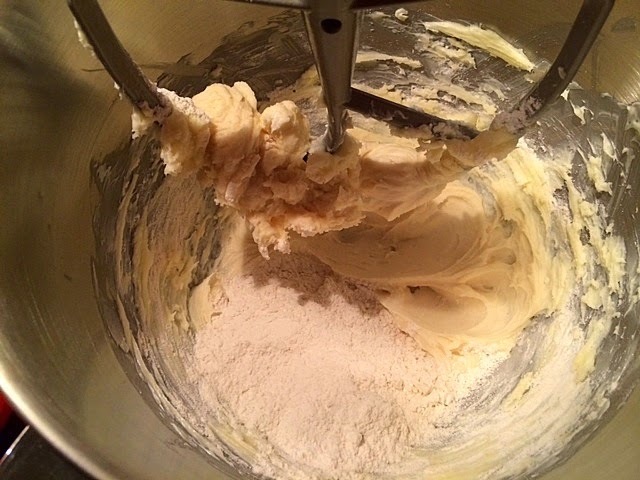 Simply remove from the mixing bowl and form it into a smooth ball. 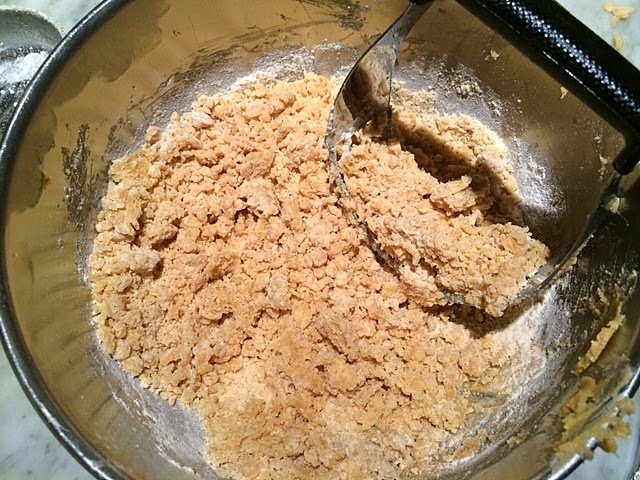 This recipe makes a very stiff dough. I rolled it between two sheets of parchment to get a (not perfect, but good enough) circle. You can also use a cookie cutter to make smaller cookies. 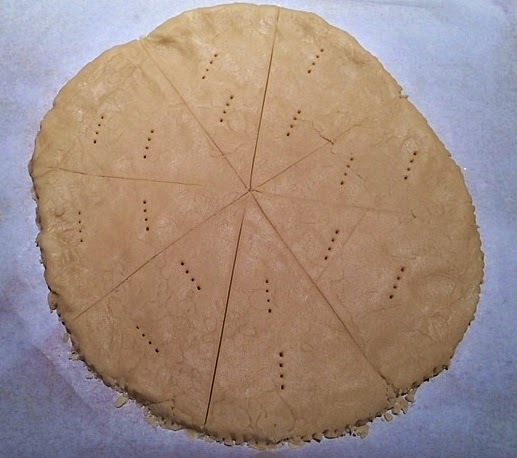 Crimp the sides of the dough with the tines of a fork. Pierce the top with the fork as well. 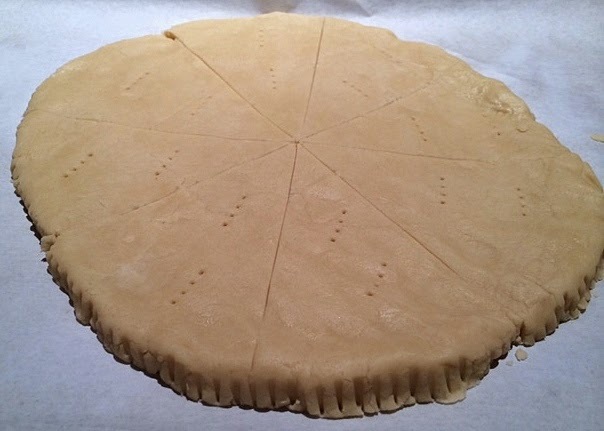 Using a serrated knife, score the dough to make for ease of separating the pieces later. 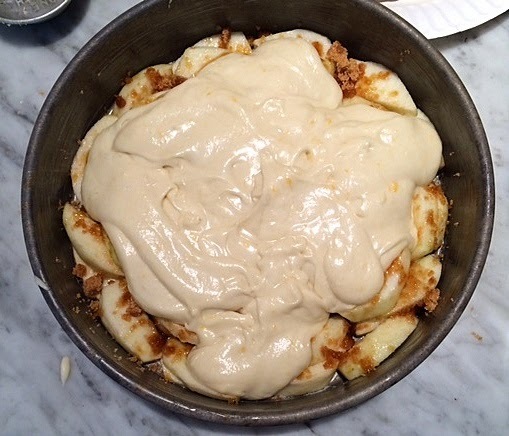 Bake until very lightly brown. 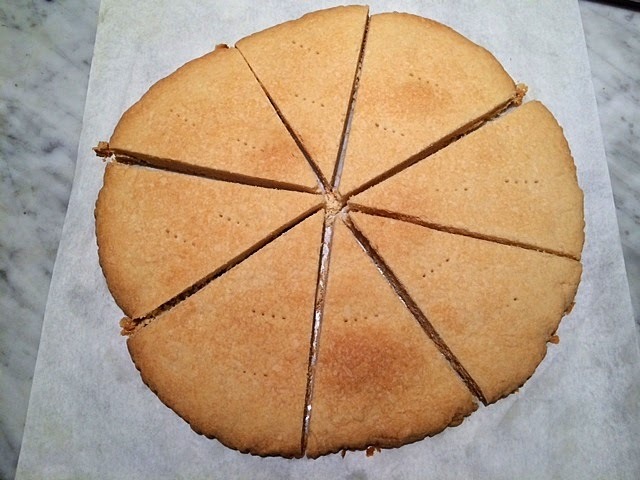 Cut into triangles and enjoy! 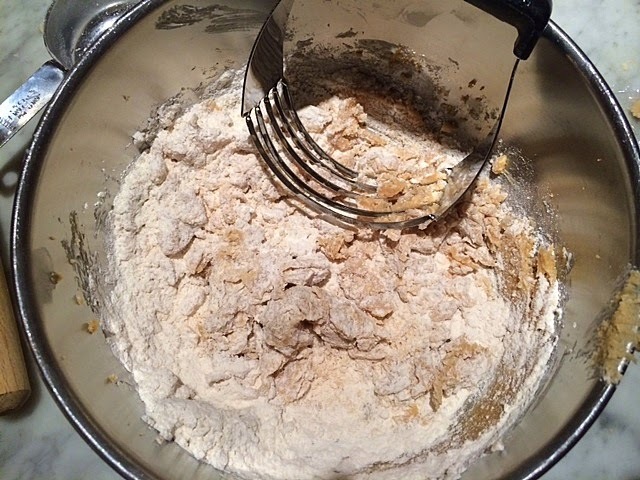 Production notes: I made the first recipe because, even though Olive suggests that the second one "might" be her mother's recipe, it is less traditional, using cornstarch in the mix. 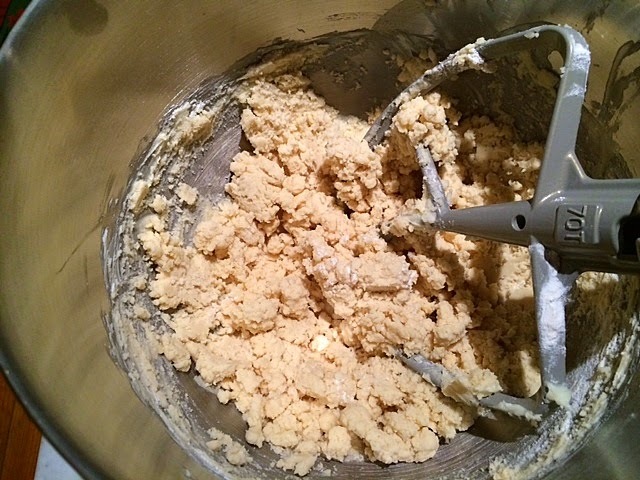 For the method, I beat the butter until soft, added the sugar and then gradually added the flour. Then I formed it into a ball and rolled it between two sheets of parchment. 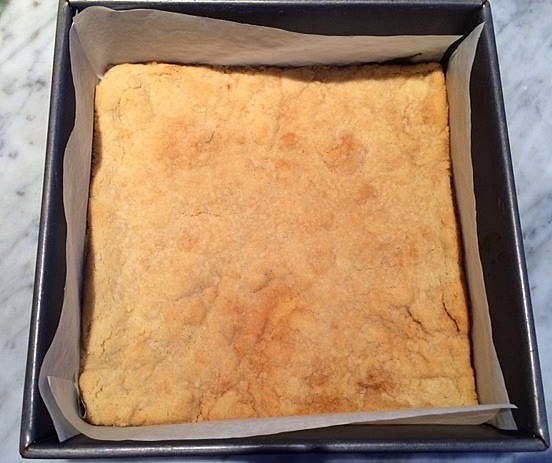 This shortbread was done in 30 minutes, so watch the oven closely. 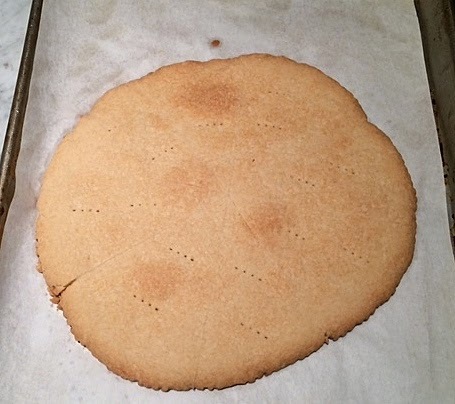 Some people say that shortbread shouldn't brown at all. Sometimes when things are too easy, one suspects that they will fail -- like, what's the catch? 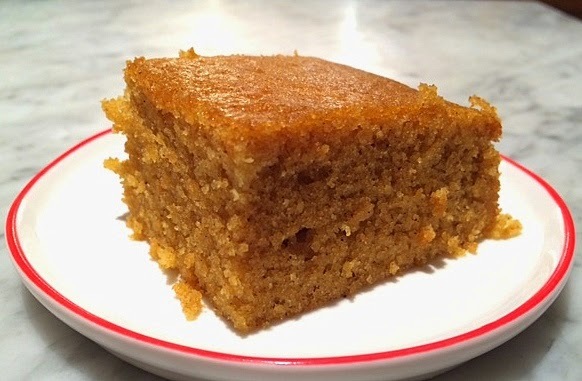 But these moist and delicious pumpkin bars prove that one can bake their cake (easily) and eat it too. 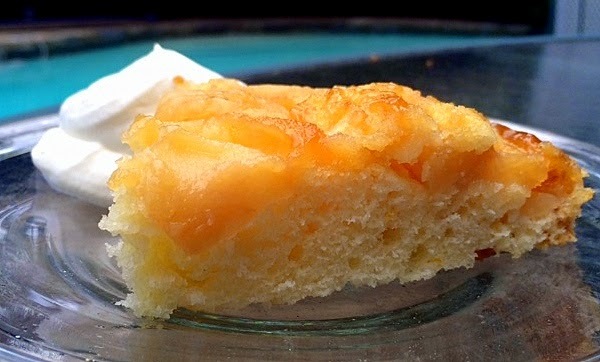 This recipe is so simple and so quick, that it's the perfect baking project for children. With ingredients found in most pantries, you can put together the batter for this dessert in minutes. 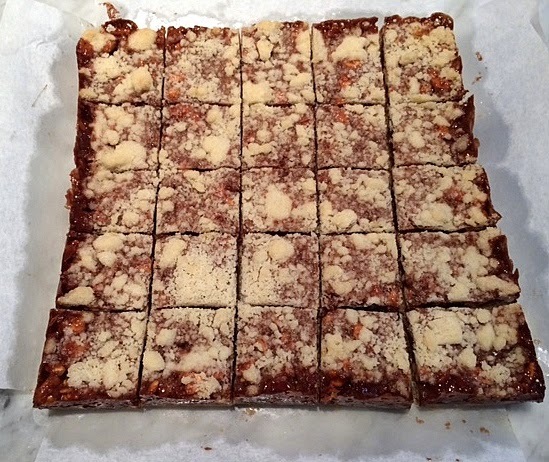 As with many vintage recipes, this one is incorrectly titled, for this is a sheet cake, not typical bar cookies. Not that there's anything wrong with that! mix thoroughly until combined. 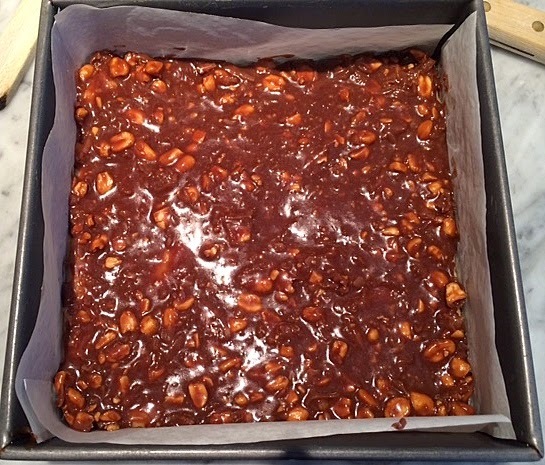 Pour into a 9 x 13 inch pan and bake. Cool slightly and cut into bars. 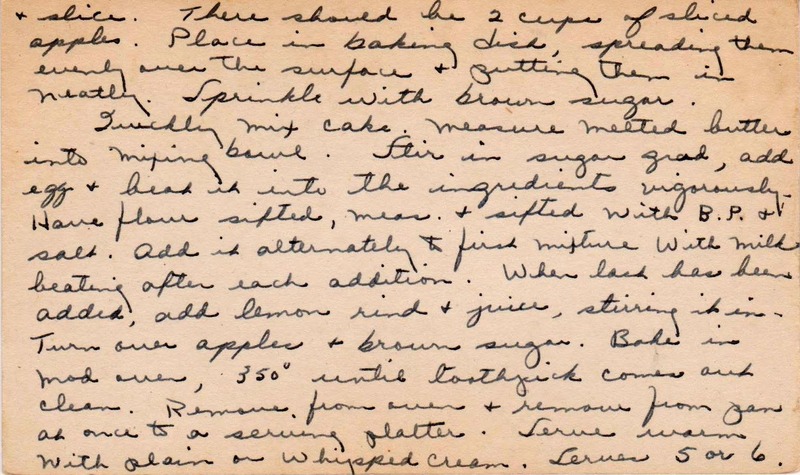 Production notes: I followed this recipe exactly, baking it in a 9 x 13 inch pan. When it was written, cans of pumpkin contained 16 ounces. Today, most have just 15 ounces, but it will be fine with the slightly lesser amount. 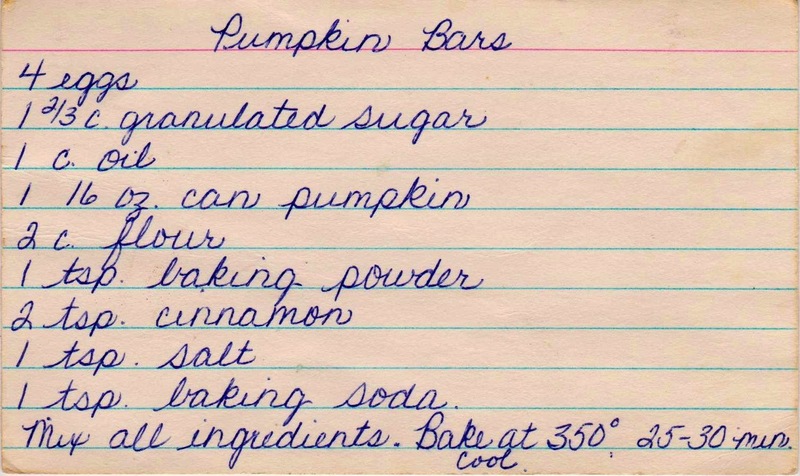 Typical of many vintage dessert recipes, this is not overly sweet. So you can make a frosting of confectioners sugar mixed with a little milk or simply dust the cake with confectioners sugar. Each fall the DH and I spend a day in the country picking apples at one of the many orchards that dot the Hudson Valley. But not this year. 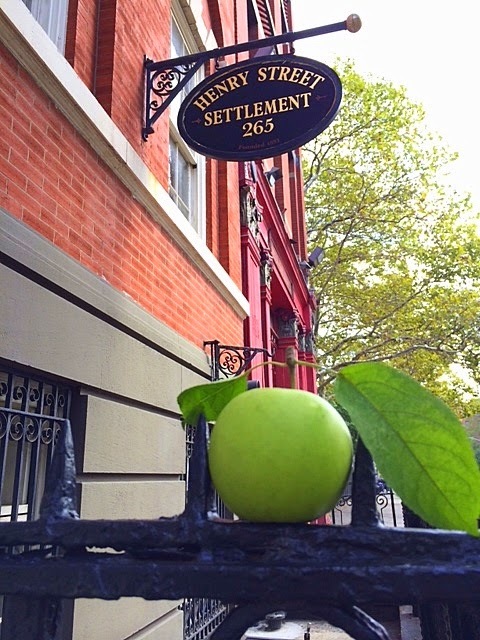 Instead, I harvested apples even more locally -- from a fruit-laden tree growing in the garden adjacent to Henry Street Settlement, my place of employ. For the first time in recent memory, the squirrels didn't destroy the crop. 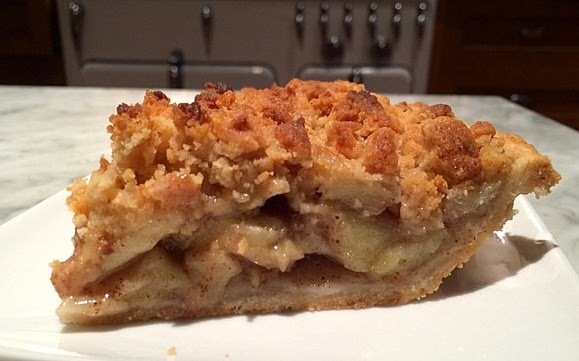 To showcase these Granny Smith beauties, I made a French Apple Pie, which is basically an apple crumb pie. 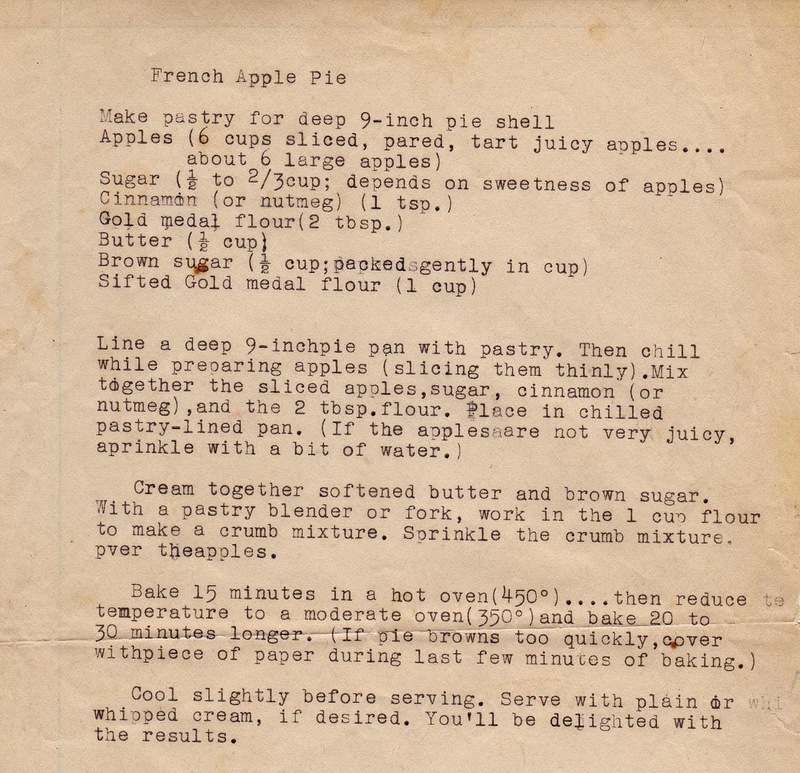 Now, I've rarely had success with apple pies -- they are either too runny or too dry -- but this vintage recipe hit it out of the park. 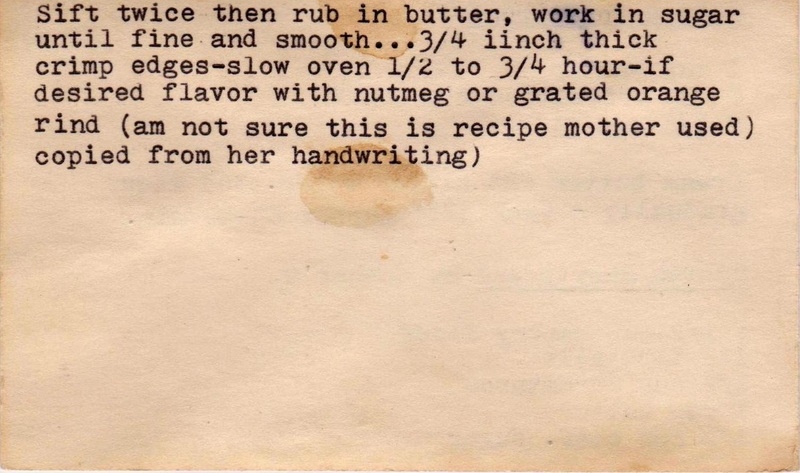 * The hand-typed recipe promised that "You will be delighted with the results." And I was. 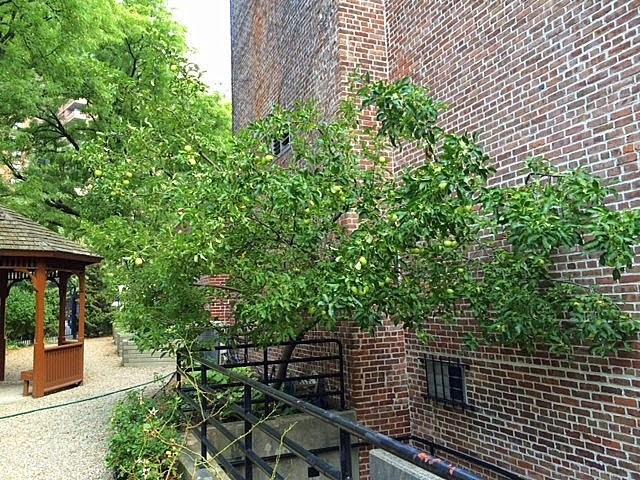 Below is the apple tree, growing in Martin Luther King, Jr., Community Park, right next to the Settlement's headquarters. 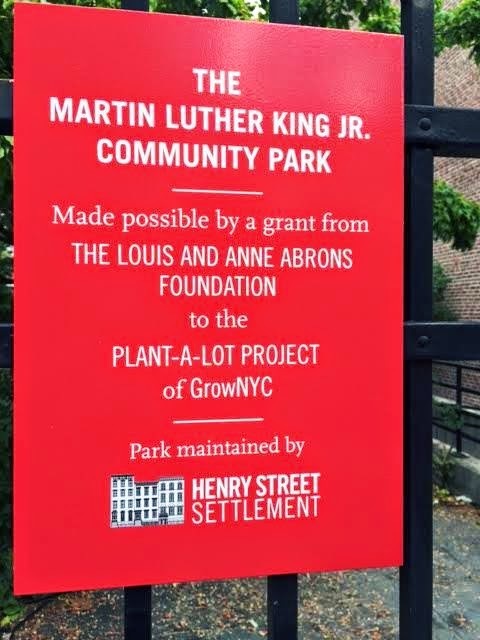 The park, a true sanctuary on the Lower East Side, was created from funds donated by the Louis and Anne Abrons Foundation to the Plant-A-Lot Project of GrowNYC. Can you tell I'm the marketing director at Henry Street? 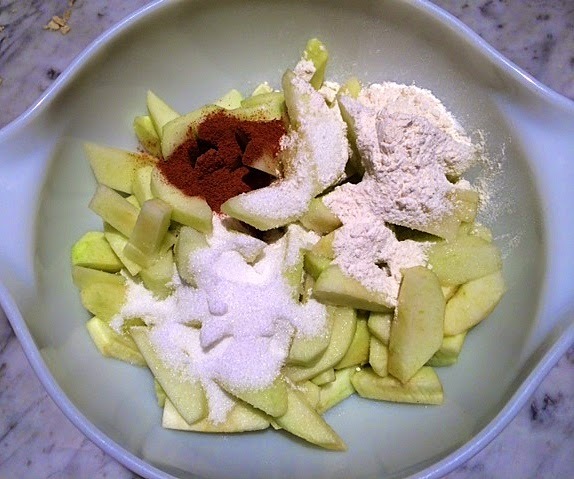 Combine the apples with flour, sugar and cinnamon. and place atop the apples. Bake for just 45 minutes. 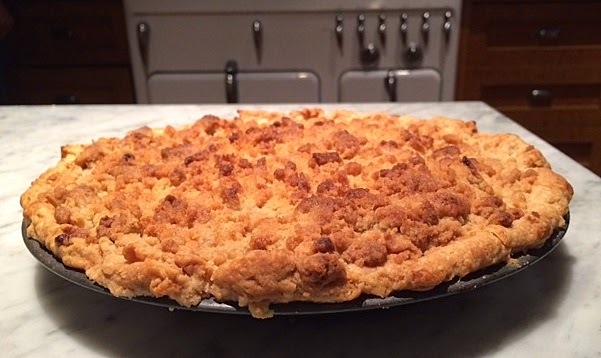 Production notes: I followed the recipe exactly, but used a regular -- not a deep dish pie pan (because I don't own one). I used cinnamon (not nutmeg) and didn't add any water to the filling. 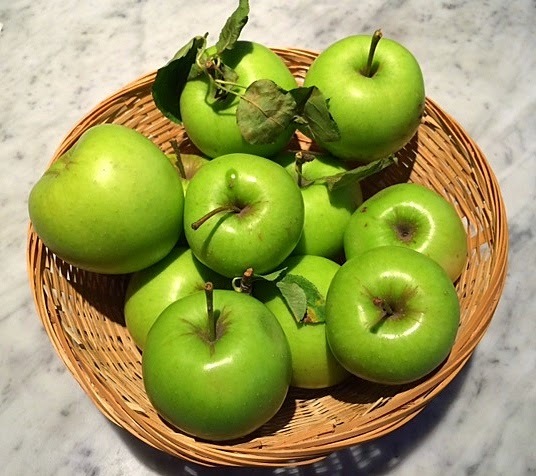 *Be sure to choose apples appropriate for pie, as some will not hold up when baked, making for a watery filling. 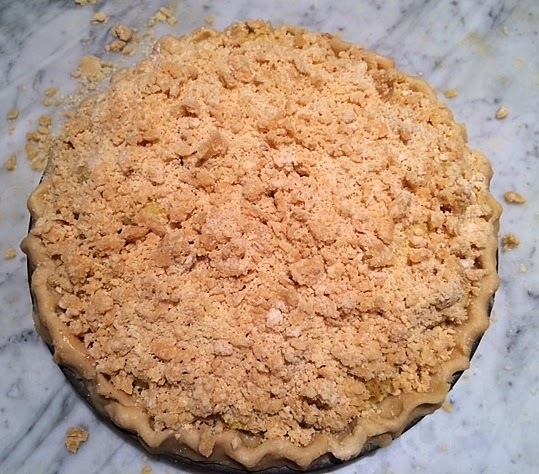 For the pie crust, I used my version of the tried and true recipe published in the original c. 1980 Silver Palate Cookbook, which is pretty vintage itself at this point. 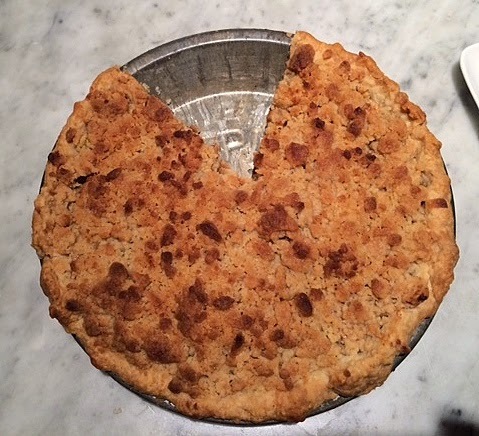 This makes a double crust, so you can cut it in half to make the single-crust required by French Apple Pie. 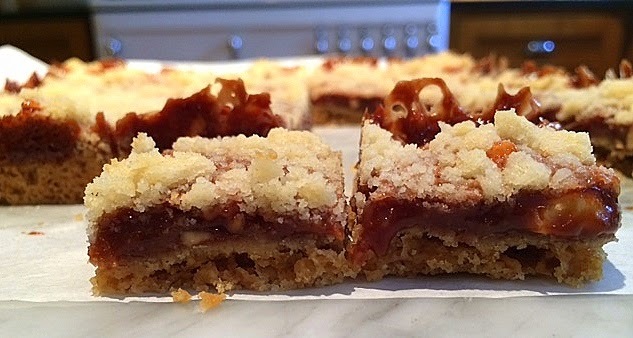 Some who say a Snickers bar can't be improved have probably never tried Peanutty Caramel Squares. 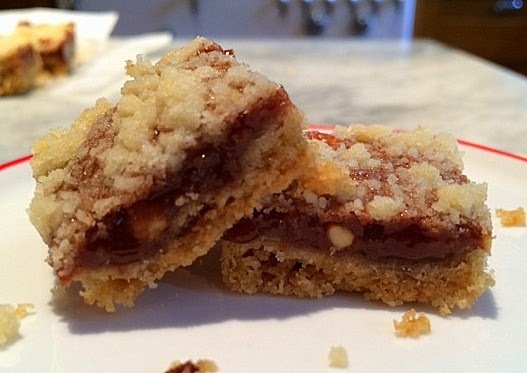 These three-layer bar cookies -- with a Snickers filling -- would make a great lunch box snack (if schools still allow peanuts, that is). 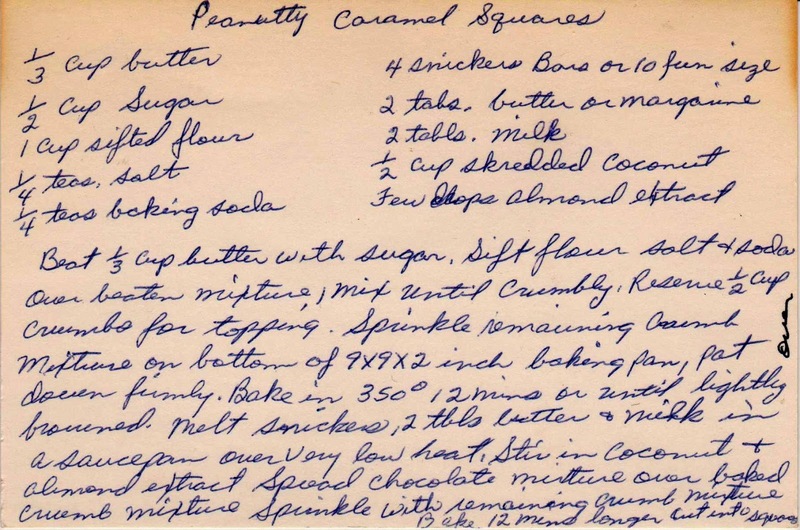 This recipe dates from the late 1960s or early 1970s, as it calls for four regular Snickers bars or 10 "fun size." The latter weren't introduced until 1968. I served these at a family barbecue, where they quickly disappeared and were especially beloved by my brand-new son-in-law. Luckily he bike races, so he can eat sweets (and everything else) with abandon. 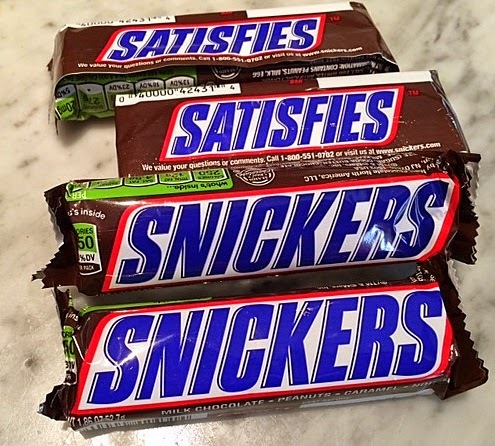 Begin by purchasing Snickers bars, below, with the not-so-subliminal message "Satisfies" on the back of the package. 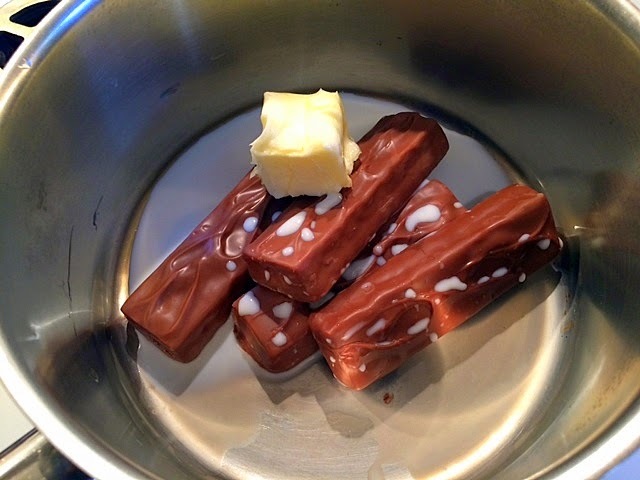 Over low heat, melt the Snickers bars, with milk and butter in a saucepan. 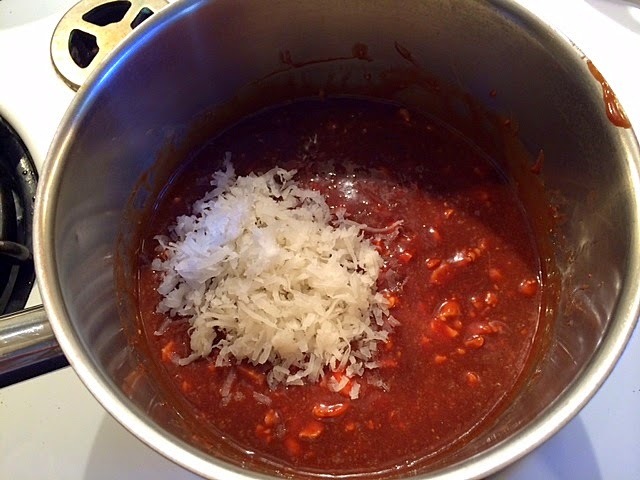 Add the coconut and almond extract. Pat down until smooth. I use gloves for this task. Pour the chocolate filling over the crust. 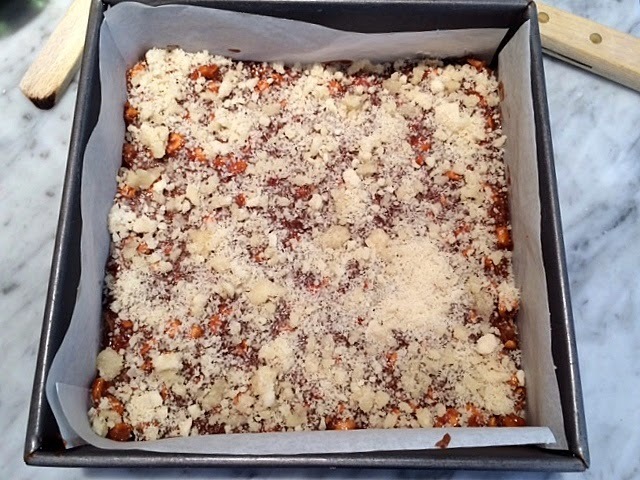 Sprinkle the reserved crumbs over the chocolate filling. 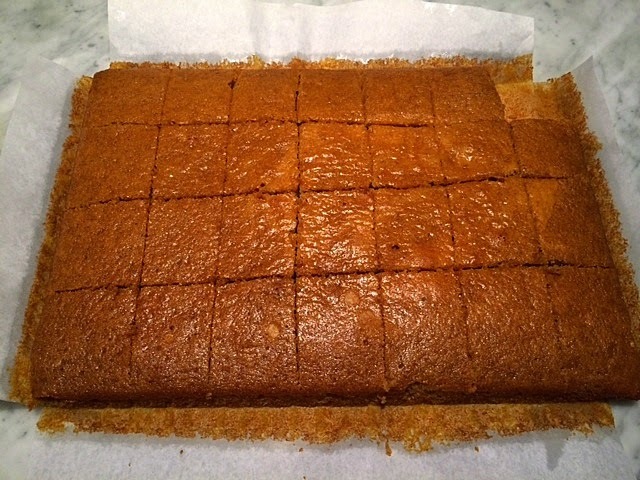 Bake, remove from oven and cut into squares. You know that saying, Don't believe everything you read? 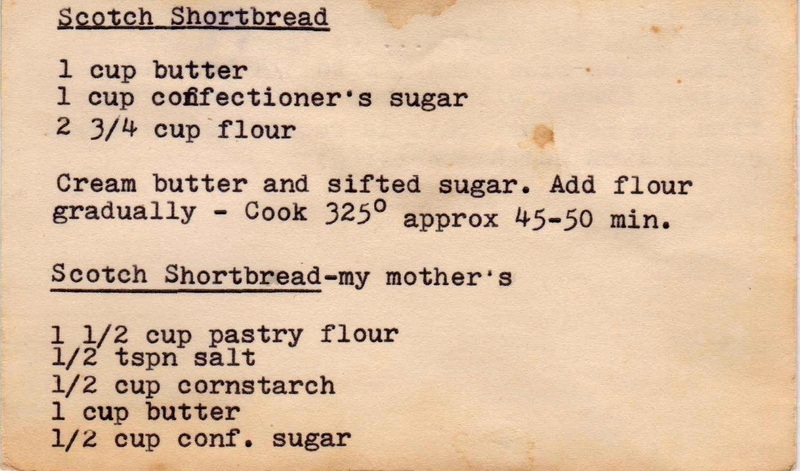 That, I discovered, applies to this vintage recipe card. 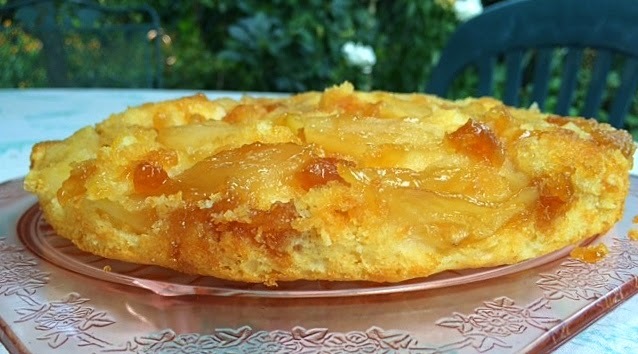 Despite the title, this is NOT apple pan dowdy, but instead an apple upside down cake. 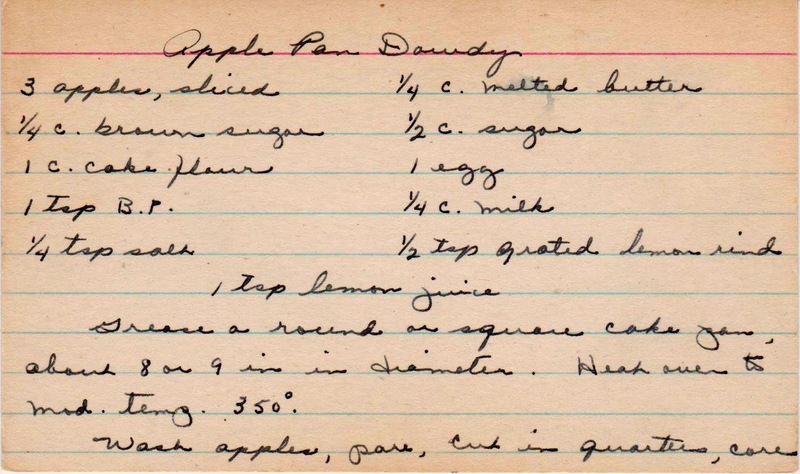 Apple pan dowdy -- the real one -- features apples covered with a short dough (think pie crust) that is"dowdied" up by putting the dough on top in pieces. 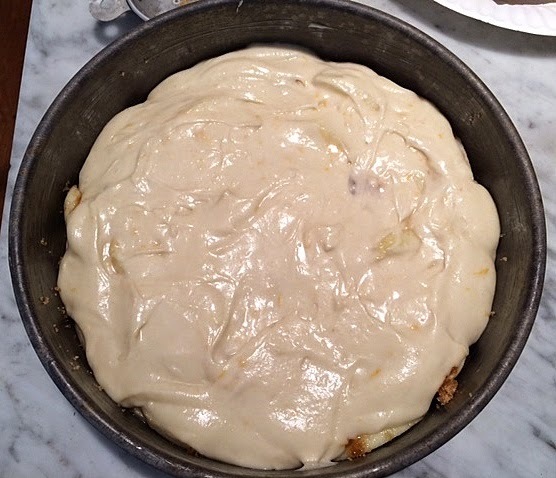 My recipe is a traditional lemon yellow cake baked atop sliced apples. 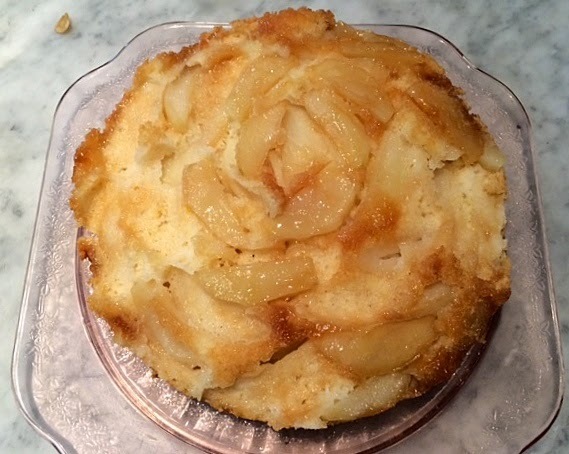 It's pretty good, and a refreshing change from traditional apple cakes that incorporate diced apples directly into the dough. 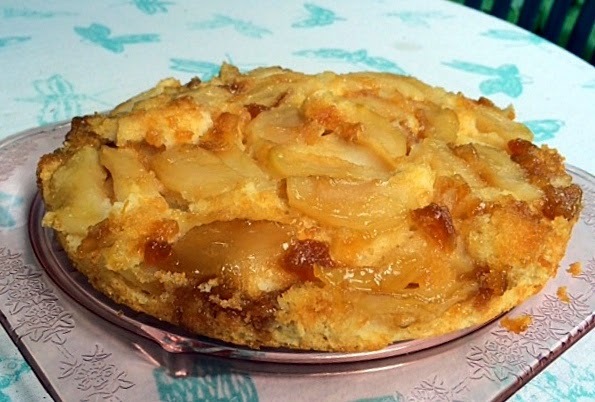 In fact, it's an American version of the French classic, tarte tatin. Begin by peeling and coring some apples. 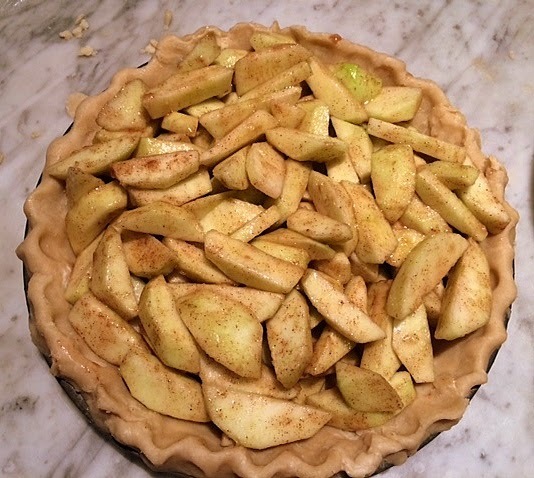 I used an apple corer, which made the task a little easier, but not much. 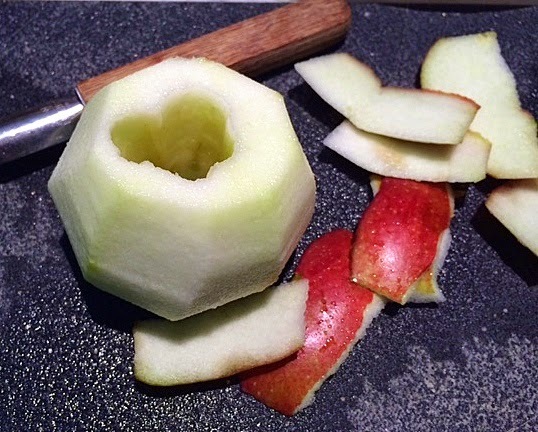 If you haven't one, simply slice each apple in half and cut out the core with a paring knife. 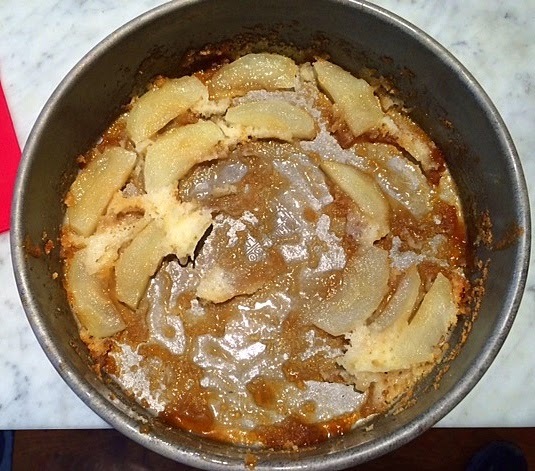 Grease an eight-inch pan and arrange the apples in a nice pattern. 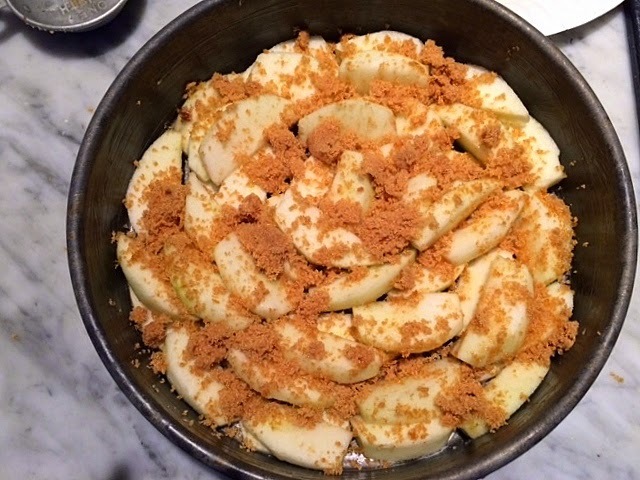 No need to obsess, just don't throw the apples in the pan. Sprinkle with brown sugar. 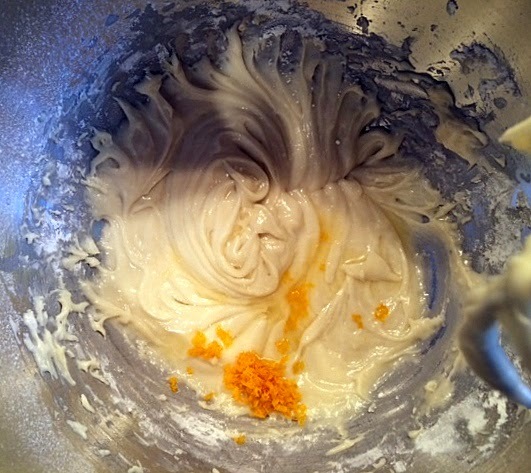 Mix up the batter and add the lemon zest. spread it evenly, so that it covers most of them. Bake for 20 to 30 minutes. Remove from the oven when the top is golden. When it's still quite warm, run a butter knife around the edge and turn out onto a dessert plate. This (below) will happen (at least it did to me both times I made it). 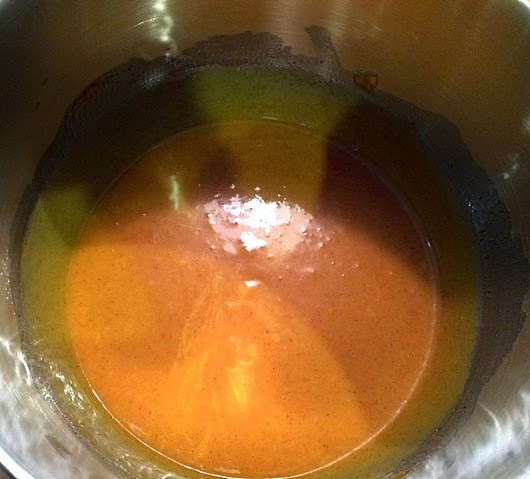 Some of the apples and the caramelized brown sugar will remain in the pan. 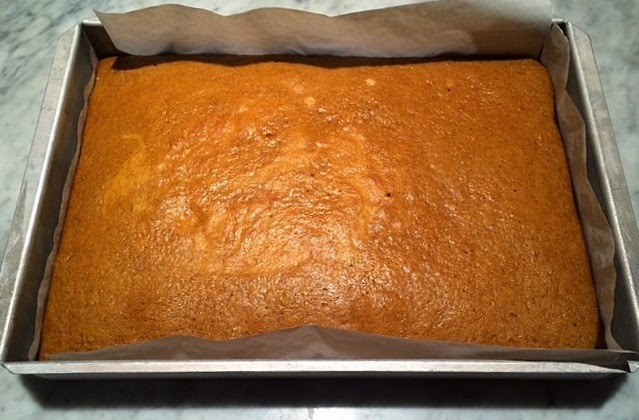 With a very small offset spatula, or butter knife, carefully lift the slices from the pan and place atop the cake. No one will be the wiser. 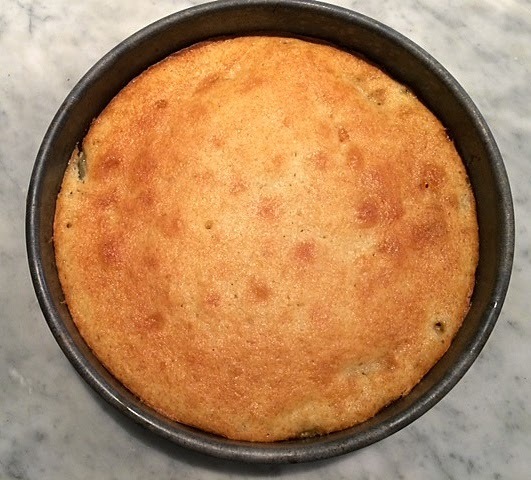 This cake is best eaten the day it is baked and is improved by serving with a dollop or two of whipped cream. 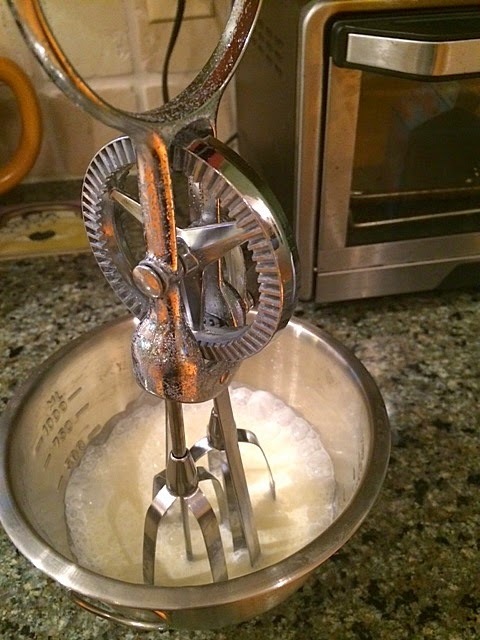 I brought this to a friend's house in Connecticut, along with a container of heavy cream which I whipped, appropriately enough, with her old-fashioned egg beaters.